Oshkosh Defense, LLC, an Oshkosh Corporation company, featured the winning Joint Light Tactical Vehicle (JLTV) at AUSA which took place October 12-14, 2015 in Washington, D.C.
Oshkosh’s JLTV is the next-generation light military vehicle delivering an exceptional combination of troop protection, transportability, off-road mobility, speed, power and life-cycle value. “The JLTV program fills a critical capability gap for the U.S. Army and Marine Corps by replacing a large portion of the legacy HMMWV fleet with a light tactical vehicle with far superior protection and off-road mobility,” said U.S. Army Major General (Retired) John M. Urias, Executive Vice President of Oshkosh Corporation and president of Oshkosh Defense. “Our Warfighters, who are courageously serving our country, deserve the most capable vehicle. We are honored that the U.S. Army and Marine Corps selected the Oshkosh JLTV as the best vehicle to serve their missions,” he added. 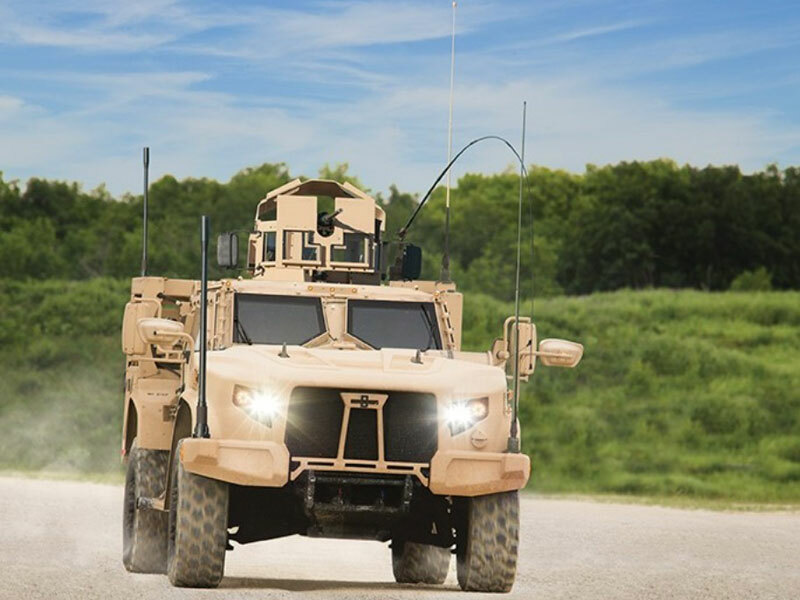 The Oshkosh JLTV combines the latest in automotive technologies, the Oshkosh Core1080™ crew protection system, and the Oshkosh TAK-4i™ intelligent independent suspension system to provide the world’s fastest, most protected light military vehicle. “The Oshkosh JLTV will revolutionize how our Soldiers and Marines get to the fight. It has been extensively tested and is proven to provide the ballistic protection of a light tank, the underbody protection of an MRAP-class vehicle, the network capability of a mobile command center, and the off-road mobility of a Baja racer. Looking beyond today’s requirements, our JLTV was designed with room for future requirements as operating environments may rapidly evolve,” Urias continued. Oshkosh has been a leading provider of tactical wheeled vehicles for the U.S. Army for nearly 75 years, including the M-ATV, FMTV, HEMTT, PLS, and HET. Oshkosh also developed the battle-tested, combat proven TAK-4® independent suspension system, which is in operation on more than 20,000 military-class vehicles.